1. Bring a large pot of lightly salted water to a boil. Add pasta, and cook for 8-10 minutes or until al dente. Drain, and rinse with cold water. 2. 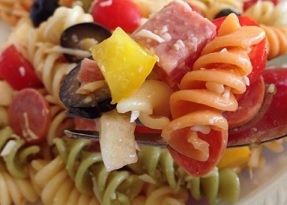 In a large bowl, combine pasta with tomatoes, cheese, salami, pepperoni, green pepper, olives and pimentos. Pour in salad dressing and toss to coat.